Commercial mailboxes of Los Cerritos Community Newspaper and several other small businesses have been vandalized over the weekend that has resulted in the theft of mail, packages, and other items in an incident that is being investigated by members of the Cerritos Sheriff’s Department. The steel mail boxes were pried open by unknown suspects at a business complex located at 13047 Artesia Boulevard (at Shoemaker Avenue) in Cerritos. This is the second time in the past few months that these same postal boxes have been broken into. It is not known when the exact incident took place and an incident report has been taken. 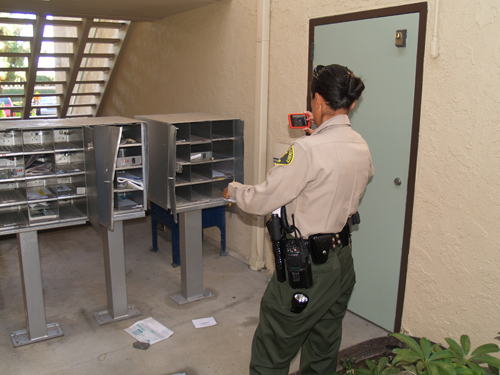 The mailboxes are located less than 10 feet from the entrance of the news room of Los Cerritos Community Newspaper. Organizations that sent payments to any business in the building should stop payment on those checks in case the vandals attempt to cash the checks.